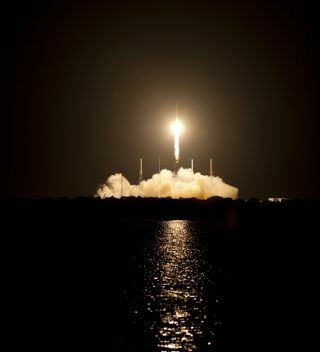 SpaceX's unmanned Dragon capsule rises into the Florida sky on the night of Oct. 7, 2012. SpaceX's Dragon capsule launched Sunday (Oct. 7) on the first-ever bona fide commercial cargo run to the International Space Station, and skywatchers in parts of North America will be able to watch it chase down the orbiting lab over the next few nights. On Monday and Tuesday (Oct. 8 and 9), the unmanned Dragon capsule and the space station will be visible as separate entities, appearing as "stars" sailing across the evening’s twilight sky. On Wednesday (Oct. 10) at 7:32 a.m. EDT (1132 GMT), the station's robotic arm will grapple Dragon and attach it a connecting port. So by Wednesday evening, both spacecraft will appear as a single bright moving "star." The space station makes one full circuit of the Earth every 91.5 minutes. Shortly after launching atop a Falcon 9 rocket from Florida's Cape Canaveral Air Force Station at 8:35 p.m. EDT Sunday (0035 Monday GMT), Dragon trailed the orbiting lab by about 10 minutes. Most satellites become visible only when they are in sunlight and the observer is in deep twilight or darkness. This usually means shortly after dusk or before dawn. Because of its size and the configuration of its highly reflective solar panels, the 430-ton space station is by far the brightest man-made object currently in orbit around Earth. On favorable passes, it can shine as brightly as magnitude -5, which rivals the planet Venus and makes the orbiting lab more than 25 times more luminous than Sirius, the brightest star in the night sky. Some have even caught a glimpse of the International Space Station just prior to sunset or shortly after sunrise. And as a bonus, sunlight glinting directly off the solar panels can sometimes make the ISS appear to flare briefly to super-brilliance. The Dragon capsule, on the other hand, is much smaller than the station, measuring about 14.4 feet tall (4.4 meters) and 12 feet in diameter (3.7 m). With its solar panels fully extended, however, the vehicle measures 54 feet wide (16.5 m). That would make the Dragon capsule about 1,500 times dimmer than the orbiting lab! To better gauge the difference in brightness, check out this video taken by Kevin Fetter — a well-known amateur satellite observer based in Canada — of the space station closely accompanied by Dragon as they glided very closely together across the sky last May during the capsule's historic demonstration mission. Each will ask for your zip code or city, and respond with a list of suggested spotting times. Predictions computed a few days ahead of time are usually accurate within a few minutes. However, they can change due to the slow decay of the space station's orbit and periodic reboosts to higher altitudes. Check frequently for updates. Another great site is this one (http://www.n2yo.com/?s=25544), which provides real-time satellite tracking and shows you at any given moment during the day or night over what part of Earth the ISS or Dragon happens to be. Editor's Note: If you snapped an amazing photo of Dragon's launch on Sunday or spot the spacecraft in orbit and would like to share the picture for a story or gallery, send images and details (including viewing location) to managing editor Tariq Malik at tmalik@space.com.